Scientists hail rapamycin as the world’s most promising lifespan-extending medicine. Already approved to treat various human disorders, scientists believe the drug blocks the key genetic pathway that controls the rate of aging of all animals, including humans. The compound has extended the lifespan of every animal tested so far, from yeast to mice. In a famous study, rapamycin increased the average lifespan of mice by about a third, and this result has been confirmed by other studies. Rapamycin has anti-aging powers that extend beyond increasing lifespan. In mice, the drug has delayed the onset of age-related diseases, lessened age-related cognitive decline, and rejuvenated the aging heart. Rapamycin holds promise as an anti-aging drug for people. There’s just one problem: The immune-suppressing drug has severe side effects. Researchers have long wished for a way to reap the life-extending benefits of rapamycin without the side-effects. They may have found a solution: Give low-dose rapamycin intermittently. Recent research has found that intermittent rapamycin dosing, perhaps once a week, may confer most of the anti-aging benefits of the drug without the side effects. Rapamycin is derived from bacteria first discovered in the soil of Easter Island. It is currently FDA-approved for use in organ transplant patients, and in the treatment of a few types of cancer. Among the weapons in the arsenal of anti-aging drugs, researchers hail rapamycin as the compound with the highest lifespan-extending potential. Because rapamycin suppresses the immune system, doctors prescribe the drug to transplant patients to stop them from rejecting their organs. Rapamycin has been shown to be useful not only as an immune system suppressant in organ transplant but as a cancer fighter and maybe even an immune system booster. Rapamycin made worldwide headlines in 2009, when a team of American researchers, led by David Harrison, discovered that the drug significantly extended the average lifespan of mice. Due to delays, the researchers delayed giving the rapamycin treatment until the mice were 20 months old, equivalent to an age of 60 in humans. At the conclusion of the experiment, the researchers were later shocked to find that rapamycin increased the average lifespan of the male mice by 28% and the female mice by 38%. The 2009 report prompted scores of researchers to scurry back to their labs and perform new experiments with the anti-aging drug. Since the famous Harrison report, rapamycin has shown promising results in the treatment of many other age-related diseases. Studies in mice have demonstrated that rapamycin therapy blocks the progression of atherosclerosis, muscular dystrophy, cancer and Alzheimer’s disease. Rapamycin causes severe side effects, including an increased risk of infection, elevated blood sugar, and increased risk of type 2 diabetes. Some of the side effects of full-strength rapamycin are extremely serious, occasionally causing death due to infections. The side-effects occur in patients who take the drug every day. The reported side effects include high cholesterol, high triglycerides, glucose intolerance, insulin resistance, new-onset diabetes, anemia, thrombocytopenia, gastrointestinal disorders, sinusitis, respiratory and urinary infections, testicular dysfunction, and skin problems. These side effects have made researchers shy about testing the drug in healthy humans, as they may substantially limit the usefulness of rapamycin as a therapy for diseases of aging. Intermittent rapamycin has been shown to reduce side-effects. Research on intermittent rapamycin dosing is promising. As we grow older, our tissues fill up with worn-out cells called senescent cells. Also known as zombie cells, these ‘walking dead’ of our bodies produce chronic inflammation known as inflammaging. Geroscientists suspect inflammaging to significantly contribute to many of the chronic diseases of aging. By producing inflammation, senescent cells are one of the key drivers of aging and cause lots of havoc throughout the aging body. To reverse aging, geroscientists feel it is best to remove the zombie cells from the body. Anti-aging researchers have identified about eight compounds, called senolytics that do just that. While these chemicals have been shown to clear senescent cells from mice, with phenomenal results, scientists have been hesitant to test them in humans. While waiting for senolytics to vetted for human use, scientists think that intermittent rapamycin dosing is a stop-gap solution, because it turns off inflammation-causing zombie cells. Campisi talks highly of intermittent rapamycin dosing. Source: Judith Campisi. Two years back, scientists showed that rapamycin acts as a circuit breaker to shut off the harmful effects of senescent cells. Because rapamycin shuts down the system for maybe a week or longer, it only has to be taken every once in a while, potentially bypassing side-effects. The discovery, published on July 6, 2015, in the journal Nature Cell Biology, shows that senescent cells have a feedback loop with other parts of the inflammation process. For chronic inflammation to persist over weeks and months, the feedback loop must be maintained. Scientists found that intermittent dosing with rapamycin breaks the loop, and this shuts off the senescent cells. Once the inflammatory loop has been disrupted, it takes time for the loop to reestablish. While the best solution is removing these cells, rapamycin turns them off for a short while. Campisi’s discovery suggests that a person could take rapamycin intermittently, say, once a week, shutting down the chronic inflammation. Because the zombie cells haven’t gone away, they will eventually find their footing and start the inflammatory ball rolling once again. A person on this regimen would repeat the dosage intermittently and substantially reduce inflammation. Given the promising animal results, a small trial tested rapamycin effects on senescent cells in humans. At the end of the trial, the researchers found that patients treated with rapamycin had lower levels of various markers of inflammation. Intermittent rapamycin may reduce the effects of senescent cells, but does it still extend lifespan? Researchers Sebastian I. Arriola Apelo and Dudley W. Lamming decided to find out. The two researchers from the Department of Medicine, at the University of Wisconsin-Madison, conducted a trial of intermittent rapamycin on mice. Apelo was also the lead author of a report earlier in 2016 which showed that intermittent rapamycin significantly reduced the diabetes-promoting side-effect of the drug. Compared to daily dosing, intermittent rapamycin has beneficial effects with no side effects. 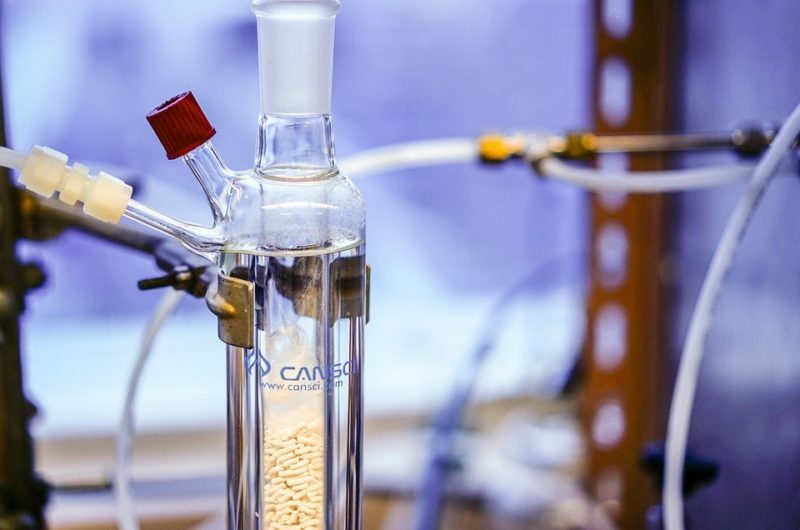 A few years ago, researchers at Novartis took things to a new level when they evaluated whether taking rapamycin could affect aging in humans. Joan Mannick, M.D., Executive Director of the New Indications Discovery Unit, of the pharmaceutical giant, Novartis reported that taking the rapamycin analog rejuvenated the immune systems of elderly people. Seniors don’t respond particularly well to influenza vaccination. As we age, our immune system isn’t as adept at identifying new pathogens. Publishing their results in December 2014, in the journal Science Translational Medicine, the researchers found that giving the drug in weekly doses boosted the immune systems of older adults. Researchers believe that rapamycin targets an essential genetic signaling pathway linked to aging and immune function. The Mannick study tested various doses and demonstrated that intermittent rapamycin dosing boosted the immunity of seniors, with no significant side effects. This is in stark contrast to the side-effects observed in transplant medicine, where physicians give the drug Everolimus, a form of rapamycin, every 12 hours and it suppresses immunity. In the Mannick study, however, they found that administering rapamycin once a week actually improved immune function. The Mannick study recruited 218 elderly volunteers over the age of 65, dividing them into four groups. All groups took Everolimus, for six weeks. They stopped the drug for two weeks, and the researcher gave them a flu shot. The researchers were surprised to find that intermittent rapamycin dosing increased immunity. After testing the level of antibodies in the participants’ blood and found that rapamycin improved the immune systems of the participants. Compared to the control group, all three of the rapamycin treated groups had a 20% enhancement in immune system response. There were no significant side effects from the intermittent dosing. Mouth ulcers, known as canker sores are a telltale sign of rapamycin side effect in transplant medicine. If a transplant patient gets mouth sores, it means that rapamycin is suppressing the patient’s immune system. The Mannick team used canker sores as a proxy for side effects and monitored mouth ulcers in the treated group and controls alike. At the end of the study, the daily rapamycin users and high dose rapamycin users had increased mouth ulcers. Of the three groups treated with rapamycin, the 0.5mg once per day and 20mg once per week had significant mouth sores. 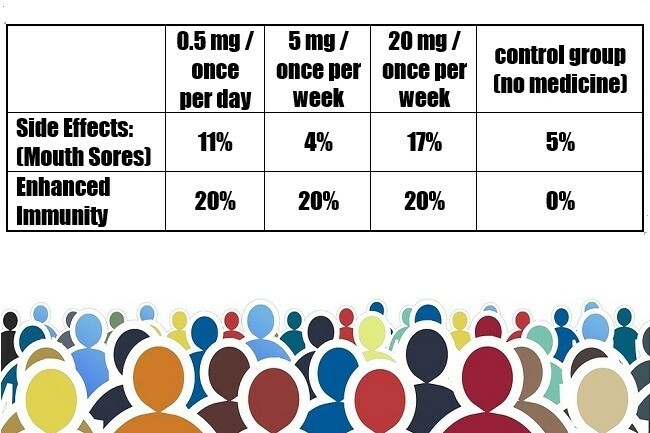 The 5 mg once per week dose, was the winner, it delivered all the benefits and had about the same number of mouth sores as the control group, who didn’t receive any medication. The control group and low-dose intermittent rapamycin users had no significant increase in canker sores and still had a 20% enhanced immunity. The result suggests that intermittent rapamycin provides health benefits with minimal side-effects. About 40% of the rapamycin-treated patients observed other side-effects, even the participants taking the lowest dosage. The researchers also found that the rapamycin-treated group had fewer white blood cells. Rapamycin has potentially life-threatening side effects. 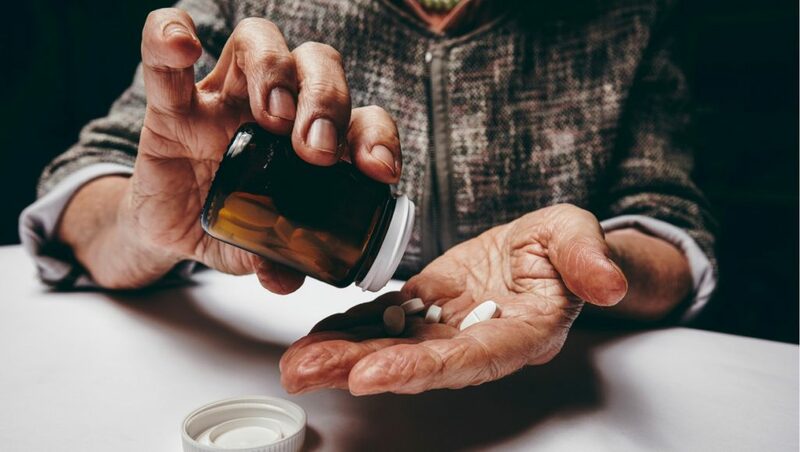 While the experimental use of the drug showed promise, more clinical research needs to be performed before the intermittent rapamycin can be utilized as an immune-boosting or anti-aging medication for seniors. Even if intermittent dosing fails to ameliorate all of the side effects of rapamycin, there is another way to skin a cat, namely, administering drugs which counteract the side effects of rapamycin. In an article published in Frontiers in Pharmacology, in October of 2016, lead author Pei Shi Ong reported that intermittent use of low-dose rapamycin is a highly promising strategy. Ong said that the side effects of rapamycin could be reduced by combining the drug with other agents that reduce the risk of type 2 diabetes. Ong suggested that metformin and resveratrol are the best two drugs to take the sting out of rapamycin. Ong also pointed to a study in which combining resveratrol with rapamycin was shown to prevent the onset of diabetes in mice. Why Isn’t Intermittent Rapamycin Being Tested? There are two leading anti-aging drugs: rapamycin and metformin. Researchers consider rapamycin to be the stronger candidate of the two, regarding anti-aging potential. However, metformin has fewer side effects. 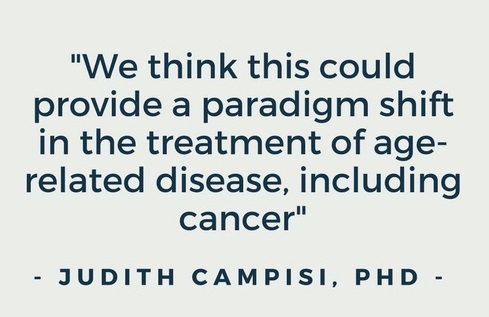 The goal of anti-aging researchers is to get the FDA to approve aging as a treatable disease. Research has already shown that metformin prevents cancer and heart disease in type 2 diabetics. Researchers chose the safer option in a large-scale drug trial. That’s why Nir Barzilai decided on metformin for the TAME Study, in the world’s first anti-aging drug trial. One clinical trial of rapamycin has already been underway since August of 2016. As the article in the link shows, the trial is testing rapamycin’s anti-aging benefits in a small group of healthy seniors. Rapamycin lengthens the lives of mice and improves the immune system of humans in clinical trials. Although it was a short trial, the drug boosted the immune system of seniors with little detectable side effects. Due to these promising results, the drug is currently being tested on healthy seniors one of the first clinical trials of rapamycin for anti-aging purposes. Related Article: Can a Revolutionary Rapamycin Therapy Stop Our Bodies From Aging? Advice, Diagnosis, and Treatment: This article does not provide medical advice and is intended for informational and educational purposes only. This article is not intended to be a substitute for professional medical advice, diagnosis or treatment. Experimental drugs and treatments pose a higher risk of side-effects that could harm your health, due to the uncertainties inherent in clinical research involving new treatments, such as using rapamycin for anti-aging. Always seek the advice of a qualified health provider with any questions you may have regarding a medical condition, and before you begin any exercise or diet program. Never disregard professional medical advice or delay in seeking it because of something you have read in this article. Emergencies: The information provided in this article should not be used during any medical emergency. Dial 911 for all medical emergencies. Endorsements & Photos: This article is not intended to endorse companies, organizations or products. Specific company names or brands, if mentioned or depicted herein are for illustration purposes only, and do not constitute endorsements of those companies or products. Links: Links to other websites or applications are provided for information only, they do not constitute endorsements of those websites or applications. David E Harrison, et al. Rapamycin fed late in life extends lifespan in genetically heterogeneous mice. Nature, 2009, 460 (7253): 392–5. doi:10.1038/nature08221. PMC 2786175. PMID 19587680. Available Online. Arriola Apelo SI, Lamming DW; Rapamycin: An InhibiTOR of Aging Emerges From the Soil of Easter Island. The Journals of Gerontology. Series A, Biological Sciences, and Medical Sciences.. 2016 Jul. Available Online. Arriola Apelo SI, Neuman JC, Baar EL, Syed FA, Cummings NE, Brar HK, Pumper CP, Kimple ME, Lamming DW; Alternative rapamycin treatment regimens mitigate the impact of rapamycin on glucose homeostasis and the immune system. Aging Cell. 2016 Feb; Available Online. Arriola Apelo SI, Pumper CP, Baar EL, Cummings NE, Lamming DW; Intermittent Administration of Rapamycin Extends the Life Span of Female C57BL/6J Mice. The Journals of Gerontology. Series A, Biological Sciences and Medical Sciences. 2016 July. Available Online. Ong, Pei Shi et al. “Judicious Toggling of mTOR Activity to Combat Insulin Resistance and Cancer: Current Evidence and Perspectives.” Frontiers in Pharmacology 7 (2016): 395. PMC. Web. 30 June 2017. Available Online. Intermittent Rapamycin currently in widespread use in clinical medicine off label at present time. Rapamycin is a generic drug approved in 1999 and since then used by a million people worldwide. Physicians don’t expect extensive human trials on a generic drug due to the great cost of human trials. When a generic drug shows excellent results for an unmet medical need, the usual response is the drug is used off label. The Mannick study in December 2014 showed 5 mg rapalog once a week had acceptable side-effects profile. The Mannick study open the door to off label use of rapamycin. That is the current situation as regards to rapamycin. Thank you Dr. Green for adding the bit about “When a generic drug shows excellent results for an unmet medical need, the usual response is the drug is used off label” To back up your argument, I can point to metformin, which is used by some physicians off label in the US to treat prediabetes. While considered off label in the US, metformin for prediabetes is approved ‘on label’ by various regulators in other countries, such as Turkey and Philippines. Thank you for adding that bit to the rapamycin case. Rapamycin will NEVER be an on-label drug for aging. One reason is FDA does not recognize aging as a disease and the other reason is as generic drug there will not be a few hundred million dollars for human clinical testing. So rapamycin will only be an off-label drug prescribed by physicians in clinical practice. Blagosklonny, who is the world leading expert on aging, diseases of aging and use of rapamycin as an anti-aging drug has stated that intermittent use of rapamycin is safer than aspirin and has recommend its current use by physicians. For some very strange reason, most people are very at ease and comfortable with the devil they know and fear the devil they don’t know. The devil people know is aging and age-related disease; that is a very formidable devil and people would be well advised to have a much greater fear of that devil; because that is the devil that will surely kill you. Blagosklonny is one of my favorite geroscientists. He’s been sadly silent these past few years. I think he’s working on a new rapalog and the lawyers have advised him to keep things under wraps. I am Alan S. Green, M.D. and just noticed your blog about me; “U.S. Doc Prescribing Anti-Aging Cocktail to Seniors” 8/17/2017. Very nice description of my practice and website. One problem, I am located in NYC not Chicago. Practice has been seeing patients for 6 months and things going very well. (rapamycintherapy.com). I expect to publish a detailed summary of initial results when first group of patients reach primary endpoint of turning 100 in good health; which should be in about 20 years. I have been on rapamycin-based treatment for about 2 years and doing very well. I would have waited for medical science to finish their clinical studies on rapamycin; only i expected to be dead before their studies on humans were finished. Hi Dr. Green – I changed the location of your practice in the article to NY. I apologize for any inconvenience it may have caused you. I also added a link to rapamycintherapy.com in the reference section. Thank you for the update, my readers and I both appreciate it. PS – You point out the inherent drawback in conducting lifespan extension (LE) studies (“I would have waited for medical science to finish their clinical studies on rapamycin”). Hopefully, LE researchers will get their act together and develop standard biomarkers as surrogate endpoints for LE studies. In his TAME study, Nir Barzilai and colleagues plan to use biomarkers.